This novel will give you an intense case of "The Feels". Please take precautions by having all the Kleenex you own at the ready! Good lawdy! What just happened to me? I have been away from all civilization because I refused to put this book down until it was finished. I could not peel my away away. Trust me, I tried! Okay, enough gushing and let's get down to the nitty gritty on why you need to get in your car, bus, taxi or walk to the nearest bookstore and buy this book IMMEDIATELY! I own The Sky is Everywhere but have not yet read it. I have heard countless wonderful things about Jandy Nelson. Believe me, I am cursing myself at this very moment for not reading her sooner. BUT, better late than never, right? 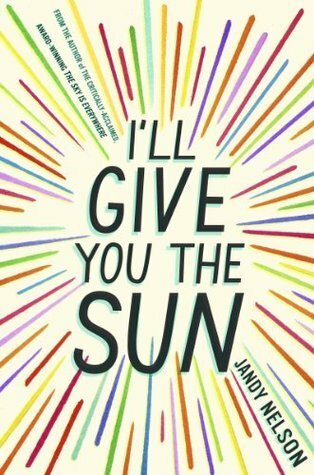 I'll Give You the Sun is a beautiful story told by 2 different point of views and 2 different timelines. We are introduced to twins, Noah and Jude. Noah's part of the story takes place during the time when they are 13 and Jude's point of view takes place when they are 16. A HUGE part of this contains a big event that the story weaves around, so I am totally avoiding that to remain Spoiler Free...And because you just have to experience it yourself! I love a good story that has elements ofpersonal growth and self discovery and this book contained those tenfold. Noah is a delicate, lovely character. Almost fragile. He loves and loves hard. And wants nothing more than to be an artist. No need for pictures in this novel. The language and lyrical flow is Nelson's writing style made Noah's art come to life in my very mind. So colourful, so beautiful. Jude is a strong character. The only person that could get all the in with her was Noah. She had so many beautiful elements about her, and aside from the artistic trait, I felt a lot of myself in her. I love when a book reaches me on a personal level! You will laugh, you will cry, you will swoon and you will be left breathless. This book will leave you reeling. Don't say I didn't warn ya! An absolute gem. A spectacular reading experience...adventure! Students who are on this board can check their WB Madhyamik Pariksha Result 2019 soon and check your result at https://www.madhyamikresult2019.co.in/ Name wise and Roll Number wise. Madhya Pradesh Board of Secondary Education will declare MPBSE 10th result 2019 Name wise roll no wise, you check the result in the official site and also in https://www.mpboard10thresult2019.co.in/. After having a look at the table given above, you will be able to understand that from the past five years, BSEB Matric Result is used to be announced in the month of June. If we talk about the date then it came to know that the Bihar Board 10th Result 2019 may be announced in the 3rd week of the month. Check more info at https://www.biharboard10thresult2019.co.in/.